The E. coli infection is linked to the cause of hemolytic uremic syndrome (HUS), urinary tract infections (UTI), kidney failure, enteritis and diarrhea. E. coli, or Escherichia coli, is a bacteria that can live in the intestines of humans and animals. When ingested, E. coli is generally fairly harmless, only resulting in bouts of diarrhea. But sometimes E. coli can contribute to severe pain, bloody diarrhea and vomiting. Generally healthy adults can bounce back from E. coli, but young children and seniors are at higher risk of developing complications associated with E. coli, such as kidney failure and hemolytic uremic syndrome. By knowing how E. coli is caused you can prevent catching the bacteria and minimize your risk of the complications associated with it. E. coli comes in many strains, but the version that leads to abdominal discomfort and diarrhea is known as O157:H7. This group of E. coli produces toxins that damage the lining of your small intestine. The development of E. coli occurs when it is ingested. Improper food handling: aside from the food products themselves, if preparation of food is not done properly it can cause the E. coli bacteria to grow. Enteritis is the swelling and inflammation of the intestines – E. coli can cause enteritis. 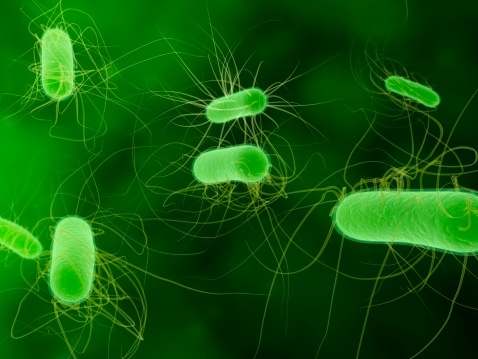 E. coli enteritis is caused the same way as other E. coli infections – through consumption of contaminated food, water, animals or person-to-person contact. Dehydration can result from E. coli enteritis as a result of the diarrhea. As a treatment staying well hydrated is essential. If vomiting is preventing fluids from staying down, an intravenous may be required in a hospital. Over the counter antidiarrheal medications are also useful to help reduce diarrhea, which can contribute to dehydration. But if blood is present in the diarrhea along with a fever, you should go to the hospital. E. coli enteritis typically heals on its own, and some research suggests that the use of antibiotics doesn’t help speed up the recovery process. Complications associated with E. coli enteritis are minimal, but in rare cases it can become quite severe and lead to hemolytic uremic syndrome, which can progress into anemia, kidney failure and death. Proper hygiene and handling of food can prevent contracting E. coli and enteritis. The urinary tract consists of the bladder, kidneys, ureters and urethra. When bacteria enter any part of the urinary tract it can result in infection. E. coli bacteria are responsible for nearly 85 percent of urinary tract infections. Typically a urinary tract infection is treated with antibiotics, as well as drinking plenty of fluids – including pure cranberry juice, not the sugary variety. Although typically antibiotics are effective in treating UTIs, some E. coli strains are resistant to them. This resistant E. coli strain is known as extended-spectrum beta-lactamase (ESBL) and is causing more and more UTIs each year. The growth of this antibiotic-resistant strain of E. coli comes from the use of antibiotics in chickens to make them gain weight. Hemolytic uremic syndrome (HUS) results from abnormal premature destruction of red blood cells. During this process damaged red blood cells clog the filtering system of the kidneys, which leads to life-threatening kidney failure. E. coli is a potential cause for hemolytic uremic syndrome. To prevent complications associated with E. coli bacteria, it’s best to avoid contact with it. Because there is no vaccine against it, you must become more mindful of your surroundings and partake in healthy behaviors for better prevention. Ensure meat is cooked at appropriate temperatures – for example, beef burgers should be cooked at 160 F (71 C). Drink pasteurized milk, juice and cider. Avoid using the same utensil for different food items. Store raw food at appropriate temperatures. Do not keep raw meat out on a counter or in the sun. Use different cutting boards if necessary. Avoid drinking water from public sources.